The famous Charkula dance of village Mukharai was conducted on the late night of 28th March and it was part of Holi Mahotsav. The world famous Charkula dance is conducted every year after two days of Holi. As per Hindu mythology, Charkula dance was started by the maternal grandmother of Goddess Radha, the consort of Lord Krishna. Radha Rani was the daughter of Maharani Keerti. Maharani Keerti was born in village Mukharai and Mukhara was the name of her mother. When the news of Radha's birth was broken to Mukharai she was so overwhelmed with the joy that she lifted the wheel of the chariot over her head and started dancing. 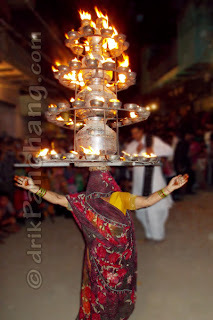 It is believed that this event started the tradition of Charkula dance. Hence this day is also celebrated as the birth anniversary of Goddess Radha. During Charkula dance, 108 lamps are lit and kept over the pyramid of wheels supported by rounded pots. The dance is done by females who cover their faces in the veil. The weight of the Charkula and the veil makes this ancient dance of Dwapar Yuga challenging to perform. Thousands of people gather to see this spectacular event every year.